SEPOY (AUS) (Chestnut 2008-Stud 2012). Leading 3YO Male on 2011-12 WTR (Sprint). Champion 2YO & 3YO Colt in Australia in 2010-11 & 2011-12. 10 wins-5 at 2-from 1000m to 1200m, A$3,880,000, ATC Golden Slipper S., Gr.1, VRC Coolmore Stud S., Gr.1, MRC Blue Diamond S., Gr.1, MVRC Manikato S., Gr.1, MRC Caulfield Sprint H., Gr.2. Half-brother to SW Mulaazem (MRC Autumn S., Gr.2). Sire of SP She's Positive, Chipanda and of Giroux and of the placegetters Havildar, Party Bag, Regimental Force, Sepae, Snow Surrender, etc. His oldest progeny are 2YOs. Q Nine Mystic (g. by Choisir). 3 wins to 1400m in Malaysia. Chronicle (g. by Snitzel). 3 wins at 1300m, 1400m in Aust. OMNITRADER (Unbridled's Song). 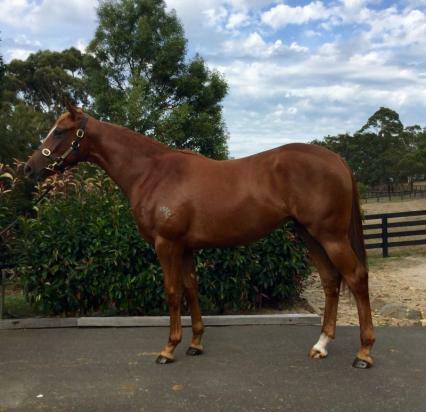 27 wins-1 at 2-from 900m to 1650m, NZ$750, A$558,905, BTC Bernborough H., L, City Pacific Finance H., Cashflowfinance.com.au H., Browns Plains Motor Inn H., QTC Charlton Boy Welter H., Lyndhurst Stud Welter H., BTC Carlton Mid Ekka H., QTC Casino Rewards H., GCTC Brannigan's Tavern H., Ipswich TC Optus Business Direct H., 2d BTC Snickers Satisfies H., 3d QTC Multiplex Portside Wharf H., Lyndhurst Stud H., City News H., Padua College H., 4th Qld Tatt's RC WJ Healy S., Gr.3, Tamworth JC Smorgon 3YO H., L.
STOCKADE (Redoute's Choice). 3 wins from 1500m to 2200m, A$105,100, Geelong Classic, L. Sire. Mishani di Caprio (Teofilo). 3 wins-2 at 2-to 1200m, A$183,800, to 2015-16, BRC Brisbane Marriott Hotel 2YO H., Rawgroup Hospitality H., GCTC First Up Racing Connections 2YO H., 2d BRC Phelan Ready S., L, Iveco 2YO H., Qld Tatt's RC Centenary Classic Mercedes-Benz 2YO H., 3d Qld Tatt's RC Breakfast Creek Hotel 2YO H.
Freak Zone - Luen Yat Freaky (Mac.) (Not a Single Doubt). 4 wins at 1350m, 1500m to 2014-15 in NZ and Macau, 2d BOP RC Cronin Cullen Egan Accountants S., Macau Grand Lisboa Cup, HKJC Garden Road H., Macau Adaminaby H., 3d Macau Autumn Trophy, L, Kempton H., Christchurch H.
CHEVAL PLACE (Snippets). 7 wins from 1100m to 1800m, A$250,495, VATC Angus Armanasco S., Gr.3, Charles Kerville H., VRC Hilton Nicholas H., VATC Safeway Fresh Food H., 2d MVRC Diamond Jubilee S., Gr.2, SAJC Tokyo City Cup, Gr.3, VATC Mannerism S., Gr.3, 3d VRC Vanity S., L, 4th VRC Chester Manifold S., L. Producer. ACADEMY DANCER (Royal Academy). 2 wins at 1000m, 1600m, A$86,700, VATC Schweppes Cup, L, Kenvain H., 3d VRC Bridie O'Reilly's Punt H.
ROYAL BABE (Rory's Jester). 2 wins at 2, Avondale JC 2YO Fillies S., L, 2d ARC Great Northern Foal S., L, 4th ARC Eclipse S., Gr.3, Rotorua RC Lion Red P., Gr.3. Producer. HEART TESTA (Testa Rossa). 8 wins to 1350m, A$516,780, to 2014-15, ATC Southern Cross S., Gr.3, 2d ATC Starlight S., L, Razor Sharp H., L, Eskimo Prince S., L, 3d ATC Bill Ritchie H., Gr.3, Darby Munro S., L.
FULLY FLEDGED (Align). Top Colt on The NZ 2007-08 2YO Free H. 3 wins-2 at 2-to 1400m, NZ$215,188, A$24,500, ARC Diamond S., Gr.1, Waikato RC James & Annie Sarten Memorial S., L, 2d Hawke's Bay Guineas, Gr.2, ARC Newmarket H., L, New Zealand Bloodstock Carnival Sale Bonus 2YO S., 3d AJC Strada S., L, STC Cadbury Fireball Quality H., Hawke's Bay New Zealand Bloodstock Insurance 3YO H., 4th STC Phar Lap S., Gr.2. Sire. Deep Snip (Snippets). 9 wins from 1200m to 1600m, A$184,415, AJC Kingster H., City Tatt's RC Laurie Wright Flying Welter H., STC Port Jackson Flying Welter H., 2d AJC Bill Ritchie H., Gr.3, 3d Newcastle JC Newmarket H., Gr.3, STC Neville Sellwood S., L.
SHOW BARRY (Baryshnikov). 8 wins from 1200m to 2050m, A$616,075, MRC Easter Cup, Gr.3, Cranbourne Cup, L, 2d Moonee Valley Gold Cup, Gr.2, MRC Naturalism S., L, MVRC JRA Cup, L, 3d MRC Sandown Classic, Gr.2. SUNRANGE (Eternity Range). 7 wins from 1500m to 2300m, A$241,905, Kalgoorlie Cup, L, WATC Playeronline.com.au H., Grey Sapphire H., Stray Bullet H.
PATPONG (Royal Academy). 6 wins to 1200m, A$255,850, MRC Schillaci S., Gr.2, AJC Balmain H., Emirates P.H., 2d QTC Cup, Gr.2. Producer. CHAKVETADZE (Taimazov). 8 wins to 1350m, A$359,200, Gold Coast Guineas, Gr.3, BRC The Big Screen Company H., EIS H., BTC Lachlan Akers the Good Guys H., QTC Ryan's Winning Edge Trophy H., 2d STC Millie Fox S., Gr.3.